Home » Blog » McDonald’s Drops The H-bomb! The F-bomb is usually used once the speaker has come to an end of their vocabulary. Like the F-bomb, the H-bomb is another bomb used today in the attempt to silence critics with intimidation, fear and shame. 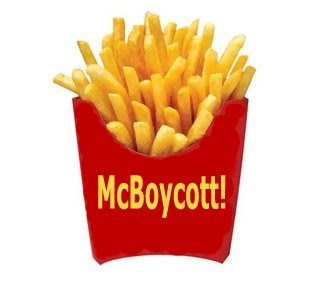 “Hatred has no place in our culture,” McDonald’s USA spokesman Bill Whitman said. Those who respond to their critics by accusing them of hatred are either too lazy or unable to come up with an intelligent, reasonable response. Hmmmm. Hatred has no place in our culture?Two things:1. This is an illogical argumement based on two accounts of logical fallacies: Distraction and Equivocation. The Distraction is the statement of a conclusion, intentionally based on a false premise. The false premise is that the opponents of the speaker are indeed practicing Hatred. The Equivocation is that the speaker is really claiming that the “hatred” to which the speaker is referring is a hatred of the sinner rather than the sin. Bill Whitman is using the equivocation in an attempt to justify the use of distraction. However, two wrongs don’t make a right. They just make him wrong twice.2. Leaving the first point aside, I have a question for anyone who maintains Bill Whitman’s stated view in the above post (I understand that the question disregards my above point. It’s a question used to expose the two fallacies in the mind of the one who answers, rather than telling that person outright. ).If “Hatred has no place in our culture,” then if someone breaks into my house, and rapes and murders my eight-year old daughter, am I supposed to believe that everything is okay with that?The only rational conclusion that I believe any reasonable person could come to when asked that question is that indeed, NO, that is not acceptable. Once one realizes that that is not acceptable, one will be forced to admit, even if it’s only in one’s own mind, that the use of the statement “Hatred has no place in our culture” is based on multiple false premises.